Google India today announced on its twitter stream that it will be kicking-off the much awaited Google street view imagery collection using Google branded cars and Google Trikes. It will be interesting to watch how Google goes about this in India. In most of the western countries it is a different thing all together. They have much better roads and much lesser traffic than in India. It sure if going to be challenging for Google cars and trikes to wade their way through traffic in Indian cities, especially in places like Bengaluru, Mumbai or Pune. The Google cars may be stuck in traffic for so long or probably will have to take diversions on India roads so very often that there mapping / imagery system may go for a toss! One important aspect that Google India tweeted was – Street view imagery in India will have all the number plates as well as faces blurred (due to privacy issues) – It has already faced a lawsuit for this earlier! 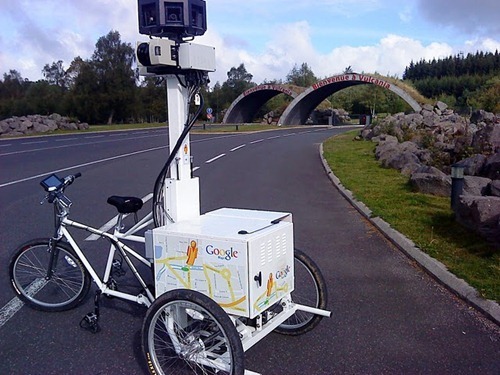 Interesting, along with Google street view cars, Google branded Trikes will also be used for collection of street imagery – I guess for India trikes may be a much better option as long as the driver is ready to put up with all the pollution & dust & heat etc. The project will kick-off on Bengaluru streets from tomorrow, so better watch out for them if you are in the city and let us know if you spot one of those – would love to hear about them ! India ranked amongst the most friendly country for Entrepreneurs! Great. Waiting to see a Google van roaming around the streets of Pune too. I think Google should coordinate with Bengaluru Municipal Corporation to get more out of its effort. The Corporation should clean all roads, inform people about the collection of street imagery so that people will be better dressed and well beahved (I am sure they already are) during the filming.